I loke it and I love it. sorv, 18 Jan 2015Guys.. tell me abt the battery life n is it worth buying edge or notIs it worth buying? This is dependant on a few things, mostly your needs, which is impossible to 'guess'! I would put myself in the 'power user' category. I now fire up the home computers noticably less often, a pattern of behaviour that begun years ago with a Dell Mini9 netbook. I love quiet computing (no fans). I wanted a tablet and, having used large phones or small phones with seperate organisers since the late 90's, this evolution of technology is fantastic. I do miss physical keyboards (HTC touch pro 2, or even my much older psion 5mx), but larger phablets onscreen keyboards I find utilitarian. Sure they won't allow 50words per minute like the Dell mini9 netbook, but sms and even a reply like this one are do-able. For me, putting the tablet and phone together is very handy. And I prefer the higher quality of this device over two cheaper devices to get the same functionality. For example: the screen is a masterpiece of colour accuracy, and even sunlight legibility. the design breakthrough with this screen is its power efficiency (previously increased resolution led to hefty power draw increases). Is it value for the edge screen variant? perhaps this is thicker premium gorilla glass 4 (the intention being maximum toughness), or perhaps this is older gorilla glass 3. It is hard to know as perhaps the oled being on a plastic backing rather than a glass sheet as it is on the Note 4 alters light t4ansmission/illumination. Maybe the raised price is just a r&d (research and development) tax. Whatever the reasons for the big price hike; it is well worthwhile for me. Just like we don't live without a taskbar on our desktop PCs; already I would hate to go back to a straight Note. I do believe with future (and more mainstream) Samsungs using Edge screens - the number of useful apps will grow. As it is, multiwindow in landscape mode, or just leaving the desktop for quicknotes and having much used apps in folders along the Edge... I wouldn't go back (to non Edge device). The Note line is the best unit on the market for productivity (S-pen, and some declare the included office suite). At the end of the day usage habits dictate functionaly benefits and price is evaluated based on disposable wealth and whether a carrier gives it at only a slight premium over the straight Note 4.
but then I prefer rugged phones I can throw on the floor at a café for when I hangout with friends... as most people put phones in cases this is, to a certain degree, a moot point. I did put a kickbutt screen protector on this device, and sans additional casing, I actually find this unit tiny and pocketable. most of the phones I have used for the last twenty years have weighed this much, so no issue there either. 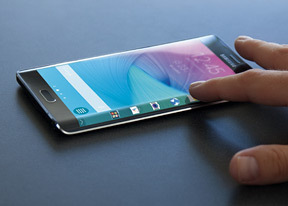 Phablets allow ridiculously low SAR (radiation absorbed by the body), and epic battery life. Dropping a tiny fraction of battery life from the Note 4 is a non issue when the battery is already twice what I am used to having. I certainly have not come close to running out of juice even with extreme usage habits. joe zero, 28 Nov 2014If this Note Edge had the same battery life as the Note 4, it would be a no brainer for me, I'... moreWouldnt worry about the battery 'discrepency'. Typically phones screens use 30% of the total battery draw. The edge screen (a f3ature that will get app support with samsungs further reliance of it in future devices) means that the phone can supply relevant data to the user without having to fire up the whole screen. This alone can bring balance to the battery dilema. Ultimately, most modern smartphones need recharging on a daily basis. This phone has given me twice my expected usage on a daily basis since day one. I have not had to recharge inside a 24hour window of time yet. And I use it a lot and in a myriad of crazy ways/through poor reception zones and even network streaming of media files etc. The edge, like a taskbar on a PC, will in time prove indespencible. This is the game changer, much like the introduction of phablets or even the s-pen. Okay maybe not as cool as a wacom in our tablet (the s-pen) if usage demands THAT feature..
my nine year olds artrage projects will attest to the stylus being brilliant. Get the edge variant. The future will make it much more useful than battery life that will seldom be required. I've been waiting since the announcement to buy this phone. Every review I read (and this one was the most inclusive) makes it more perfect for me. I'm getting so impatient being a Verizon user but I'm truly hoping Verizon models will include the Snapdragon 810 to make it well worth the wait! I'm very disappointed it's not waterproof and no NFC for recharging. Other than those to disappointments i'll simply have to wait for my dream "interactive projection screen w/ spen" that would make any cell phone the perfect cell phone. This phone is excellent if you want a lot of processes going on at the same time. however if you are really that much of a busy person then a good destkop with two or more monitors is what you need. The way the phone is designed means that although you have the option to check the stock market, do your online banking all whilst writing your shopping list it isnt actually that achievable on a phablet. They should have also marketed this for left handed market. I think Samsung feel they need to cater to more than one market at the same time, whilst their handsets are of good quality the rush job to beat competitors means there are some serious design flaws. I will change from iPhone to this phone. As for battery life nowadays there is power bank so no worries. My only worries is if the phone drop on the floor the edge screen will be crack. Costing almost $200 premium over the regular note 4 is hard to swallow by anyone. Use that money buying smart watch instead of the edge. Samsung could have used up the energy and man power better..this phone is just a gimmick..too much of Galaxy Note 4 in it. Sungsam, 15 Nov 2014that heart rate sensor is useless. most people dont need it.Nobody *needs* it, but some people *want* it.